The End of Heart Disease explains the specific ways you can modify your diet to prevent and reverse coronary artery disease. All of the advice is supported with solid published research. Chapter 9 provides 93 pages of healthy recipes. • Recommended for: Anyone who wants to prevent coronary heart disease! Joel Fuhrman, MD, is a family physician in private practice in New Jersey. For more than 25 years, he has been promoting the health benefits of a plant-based diet that he calls "The Nutritarian Diet." He has published other books on this topic, several of which have become New York Times bestsellers. Dr. Fuhrman has appeared on The Dr. Oz Show, The Today Show, Live With Kelly, Good Morning America, and has done 4 PBS specials. He is also the research director of the Nutritional Research Foundation, based in Flemington, NJ. Dr. Fuhrman earned his medical degree from the University of Pennsylvania. In the early 1970's, he was a world-class pairs figure skater. Learn more about Dr. Fuhrman, his books and publications, and his program at: www.DrFuhrman.com. Joel Fuhrman, MD, calls his plant-based diet "The Nutritarian Diet" (a derivation of "nutrients" and "vegetarian"). He recommends that we should consume 90% of our food as raw, unprocessed plants. He actually specifies at least "a half-pound of raw vegetables" and at least "a half pound of cooked, green vegetables" every day (Fuhrman J, et al. 2017). • Introduction: The Introduction is well-written. Dr. Fuhrman starts off by describing a soon-to-be patient of his who was having chest pains right in front of him just prior to a presentation he was about to give. Dr. Fuhrman put him on the Nutritarian Diet and initially dictated everything he should eat. Within several days, the patient's chest pains faded away. After the first week, his blood pressure began to come down. After several weeks, the patient could walk a few blocks without any chest pain. At 8 weeks, he was jogging. At 12 weeks, he could exercise hard, still without any chest pain. He had also lost 30 pounds at this point. After 1 year, he had normal blood pressure and no chest pain. Dr. Fuhrman has been prescribing this Nutritarian Diet to his patients for over 25 years. He just hasn't published tons of research papers about it. But, he states that not one of his patients who followed his diet has died from heart disease, or even had a heart attack. In this Introduction, he describes the disappointing state of health (disease!) in the US, but, also mentions the evolution of a new primary care professional society called the American College of Lifestyle Medicine. • Chapter 1: In this chapter, the author refers to the "standard American diet" and states that the abbreviation -- SAD -- is an appropriate description of how most people eat. In fact, he prefers to refer to it as the "deadly American diet." He then explains one of the fundamental principles of the Nutritarian Diet: All the foods must have a high nutrient:calorie ratio. He has created the "Aggregate Nutrient Density Index (ANDI)". This may seem overly technical, but Whole Foods Market displays this detail right on its shelves and customers use it. For example, kale ranks near the top while sugar ranks at the bottom. Surprisingly, olive oil has a low score. Why? Because the oil doesn't contain all the same nutrients found in whole olives. Olive oil is low in nutrients, but high in calories. • Chapter 2: Here, Dr. Fuhrman reviews the pathology of coronary artery disease. He explains that some of the standard diagnostic tests used to detect blockage in coronary arteries aren't very reliable because lots of people with only a moderate amount of blockage can still have a heart attack. • Chapter 3: This chapter is 40 pages and is powerful. Dr. Fuhrman explains how effective his Nutritarian Diet is: Patients with hypertension reduce their systolic BP by an average of 25 points, and their diastolic BP by an average of 15 points. On one day in his medical office, he saw 5 patients who had decreases in their LDL-cholesterol ranging from 65 to 87 points compared to their prior office visit....all without the use of prescription drugs. He contrasts his dietary approach (along with exercise) to the drawbacks of using drugs like diuretics, beta-blockers, calcium-channel blockers, statins, and aspirin to prevent vascular events. • Chapter 4: In this chapter, Dr. Fuhrman explains the biochemistry of why his plant-based Nutritarian Diet works. This information is detailed. It's good, but because he mentions specific nutritional molecules -- eg., anthocyanins, carotenoids, epigallocatechin gallate, flavonoids, glucosinolates, isothiocyanates, lipofuscin, myrosinase, sulforaphane -- some readers may struggle with such scientific dialog. Yet, most have heard of nutrients like beta-carotene (from carrots) and lycopene (from tomatoes). More importantly, he makes 2 critical points: (a) the best results occur when the diet contains many types of plants and (b) the standard American diet induces a state of low-grade inflammation which, in turn, promotes chronic disease. The take-home message is this: Vegetables, beans, nuts, seeds, and fruits are health-promoting foods. Excessive amounts of animal products and refined carbohydrates produce chronic disease. • Chapter 5: Here, Dr. Fuhrman discusses the very complicated topic of fats and oils. He explains that when risky saturated fats are replaced with just-as-risky refined carbohydrates, it leads to erroneous research conclusions that confuse consumers. He clarifies that, yes, saturated fats DO increase the risk of coronary disease. Most readers have heard this. But, he also makes it clear that a diet high in refined carbohydrates (ie., not just sugar, but all forms of starchy foods like chips, crackers, bread, pasta) also increases the risk of coronary disease. Many readers may not be as aware of this dietary concept. He emphasizes the health benefits of nuts and seeds (chia seeds, flaxseeds, hemp seeds, and especially walnuts), and also states that a vegan diet is often not healthy because it may be very low in the desirable fats these foods provide. • Chapter 6: This chapter is about the dangers of consuming too much salt (sodium). It's another superb discussion. Dr. Fuhrman points out why some studies showing no risk from diets containing 3000-4000 mg of sodium are flawed: they included the wrong types of patients, and, these studies didn't last long enough. Fuhrman states that it is more natural for us to consume about 500-750 mg of sodium per day, as we did thousands of years ago. He recommends no more than 2000 mg per day, and preferably, no more than 1000 mg per day. My only criticism with this chapter is that Fuhrman doesn't discuss the requirement for higher sodium intakes when people exercise, and, especially, during periods of heavy sweating. • Chapter 7: This chapter is an interesting comparison of other heart-healthy diets: the DASH Diet, the Dean Ornish program, the Caldwell Esselstyn approach, the Pritikin program. Dr. Fuhrman states that there are many similarities, but, criticizes Esselstyn's strict vegan and oil-free approach. This chapter is really well-done. • Chapter 8: This chapter picks up on Chapter 4, but without the heavily scientific discussion. Here, Dr. Fuhrman describes the food choices in the Nutritarian Diet: "eat a large salad, as the main dish of that meal, at least once a day." For many readers, this could be the most helpful chapter of the book. Pages 233-246 list specific menu choices for 2 weeks on the Nutritarian Diet. • Chapter 9: Chapter 9 is simply a collection of recipes...dozens and dozens of them. • Chapter 10: This chapter is a Question/Answer format, presumably, questions that Dr. Fuhrman encounters repeatedly. There are useful tid-bits here. • Photos & Illustrations: Only one photo (a cross section of an artichoke) and two illustrations (both in black-and-white) appear. These are adequate, though the diagram of a plant cell on p. 109 may be over the head of some readers. • Tables & Graphs: This book contains numerous tables and several graphs. Generally, these are helpful, though the graph on p. 71 could be improved by clarifying that the left side is systolic blood pressure and the right side is diastolic and the table on p. 177 comparing Celtic salt vs. spinach could be improved by listing the sodium content of each. • Documentation / Accuracy: The author refers to published scientific research throughout this book. A Bibliography listing hundreds of specific research papers is provided at the end. It takes up 39 pages. In my opinion, this is a major strength of this book. • What I Liked: Complex concepts are explained in a clear and easy-to-understand way. Fuhrman has a unique way of explaining some concepts: "Nuts and seeds grow on deep-rooted trees and are naturally packaged in protective shells. They retain their nutrients well after being picked, and their rich mineral, fiber, flavonoid, and sterol contents result in about half the heart attack rate [in people who consume nuts regularly compared to those who don't.]" On p. 195, he flatly states: "Refined carbohydrates, such as commercial baked goods made with white flour and sugar, need to be 100% GONE from your world." • What Could Be Better: It's misleading to point out flaws in this book because, honestly, there aren't any. But, one possible improvement would be to discuss the health benefits of exercise a little more. Following a perfect diet -- even The Nutritarian Diet -- shouldn't imply that regular aerobic exercise can be ignored. For example, in Chapter 6, Dr. Fuhrman warns of the risks of consuming too much salt (sodium). This is good advice, however, he doesn't discuss how exercise -- and, in particular, sweating! -- impacts on your sodium intake requirements. If you're playing a 2-hr tennis match, competing in a triathlon, running a marathon, or simply outside in the heat doing yard work, more than likely you need to increase your salt intake! Further, the combination of aerobic exercise plus sweating also exerts a powerful blood-pressure lowering effect. 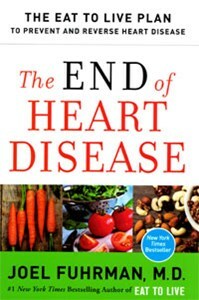 The End of Heart Disease is a superb book. My ranking system is a 1-4 scale. If it was a 1-10 scale, I'd give it a 10!! 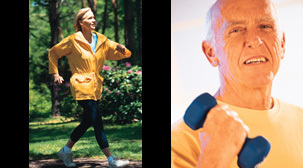 Admittedly, preventing heart disease with exercise and "smart" nutrition is my #1 interest, so I may be a tad biased. Nevertheless, this book is extremely well done. I read an enormous amount of medical research on this topic yet I still learn additional details from Dr. Fuhrman's publications. Some readers may not fully appreciate how much research has gone into this book, and may not care that these hundreds of research papers are listed in the Bibliography at the end. But this is powerful, and adds tremendous validity to all his recommendations. I feel that this book is mandatory reading for everyone. While this is a consumer book, all physicians should read it as well. Even though the title specifies "heart disease," following Dr. Fuhrman's Nutritarian Diet has also been effective for managing diabetes, obesity, hypertension, and is likely beneficial for reducing the risk of cancer, depression and dementia, too!